Many Colors, Shapes, and Types! Natural Opal: Real, natural opal has not been changed from its natural state--except to be cut and polished into a gem stone. 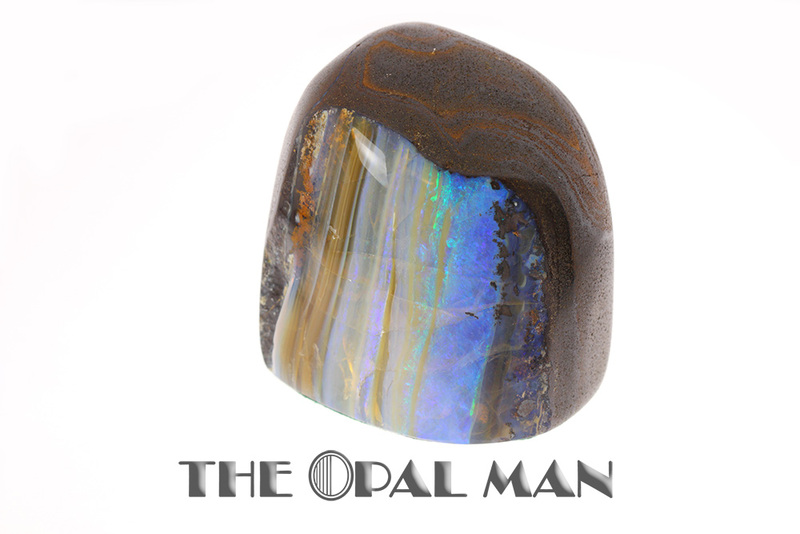 The Opal Man carries many types of natural opal, including Australian black opal, crystal opal, white opal, boulder opal, and opal specimens. The doublets we carry and make are also cut from and made with real, natural opal. (More on opal doublets, below). We also carry authentic opal from Mexico and Ethiopia. The specimen presented here shows a striated opal deposit on its host stone, Australian ironstone. It is cut and polished, and it is from Queensland, Australia. Australian Black Opal is one of the most well-known and valuable types of opal. 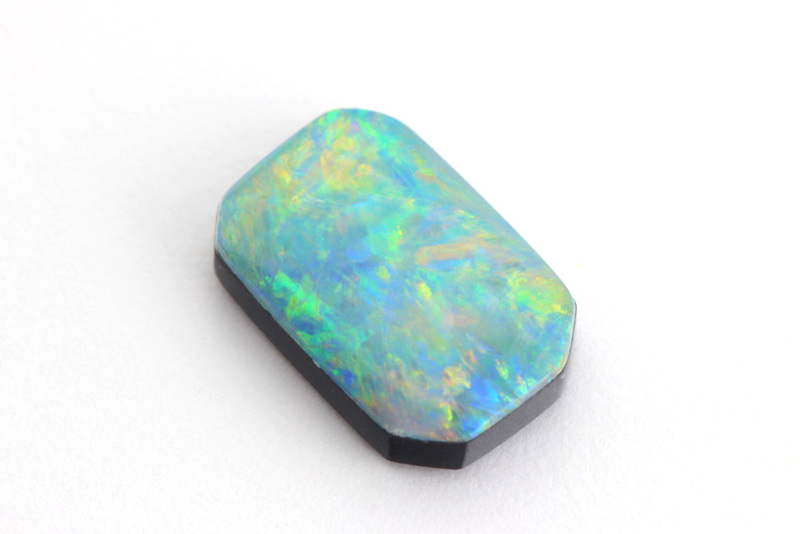 While some people mistakenly expect black opals to be very dark or black, the name actually comes from the color of the host stone where the opal formed. This host material, which can appear a range of tones from gray to black, is naturally occurring and can often be seen on the back of the polished black opal. The stone cutter did not remove the dark, opaque background because it has the effect of enriching and saturating color, and it increases the value of the stone. White opals have a white base, and the color play and patterns present themselves in this white opal base. 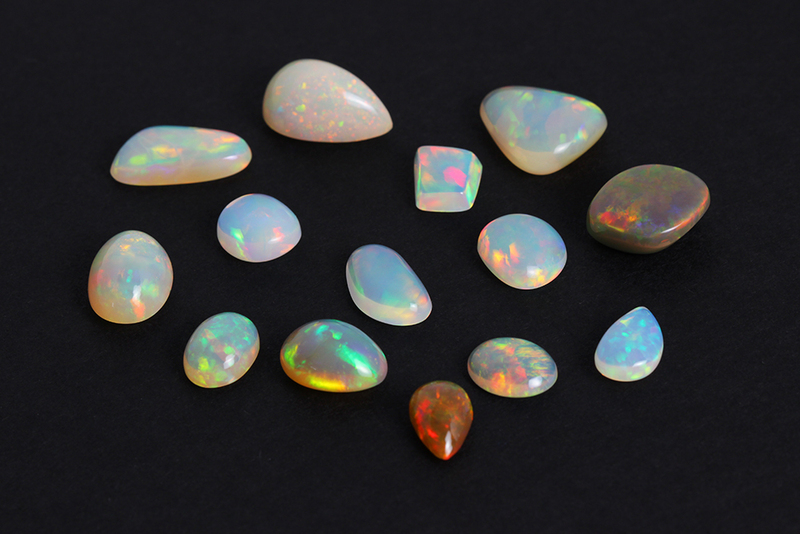 Opals in this category can host a wide variety of colors and light play patterns. White opals may be the most common type of opal because they were marketed well early in the 20th century. Customers who come to The Opal Man for the first time are often surprised to see all of the other colorful types of opal we carry. White opals are often the most difficult to photograph, too, because their colors can be so pastel and delicate. In a crystal opal, on the other hand, the color play presents itself against a transparent or translucent opal base. 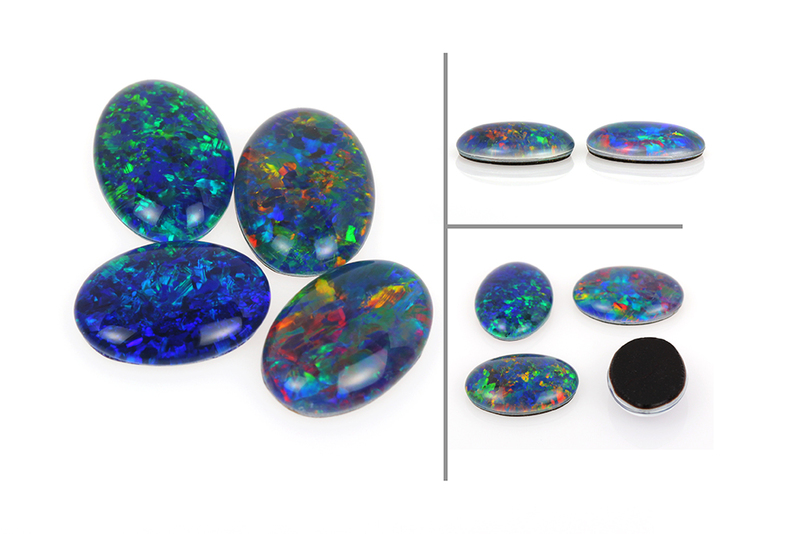 Light can pass through a crystal opal and light opal, where it cannot, generally speaking, pass trough a black opal. Boulder opal is found in select areas of Queensland, Australia. The term boulder comes from the ironstone on which the layer of opal is formed, often giving the opal an uneven surface that further enhances the array of colors. The material is cut and polished with the opal material still attached to the parent material (e.g. ironstone) on which the opal formed. Boulder opal presents beautifully in jewelry of all types, including men's jewelry. 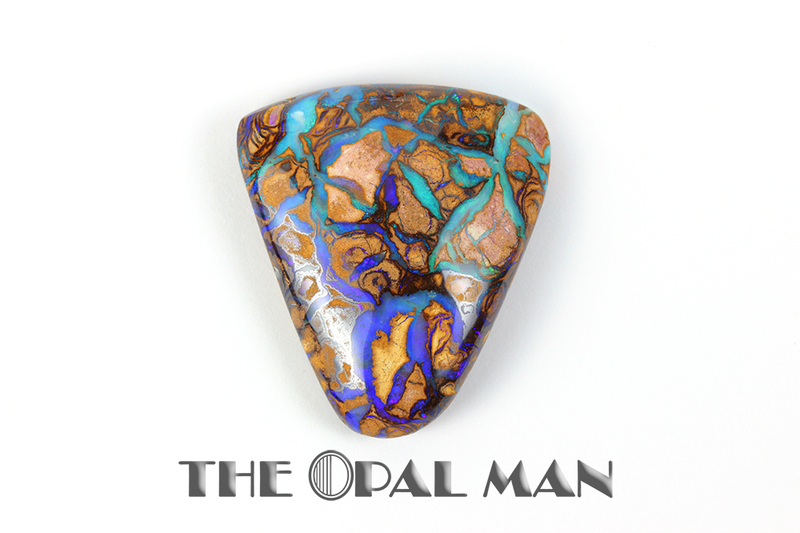 When the parent stone is visible alongside the opal, as in the pendant shown here, it is called boulder matrix opal. Koroit boulder opals are found exclusively in the opal fields of Koroit, Australia. These durable stones are among the hardest opal material of all boulder opals. Unique, artistic design and beautiful patterns of vibrant color are characteristic of Koroit boulder opals. They make stunning pendants and rings, and they stand out in a gem collection, too! Doublet opals can have a wide range of striking, beautiful color play and flash. A doublet opal is comprised of two layers, a top layer of real, natural opal bonded to a bottom layer of darker stone. Natural Australian ironstone or black onyx is often used for this second layer. The addition of the darker material can give the visual effect of deeper, saturated colors, like a black opal. 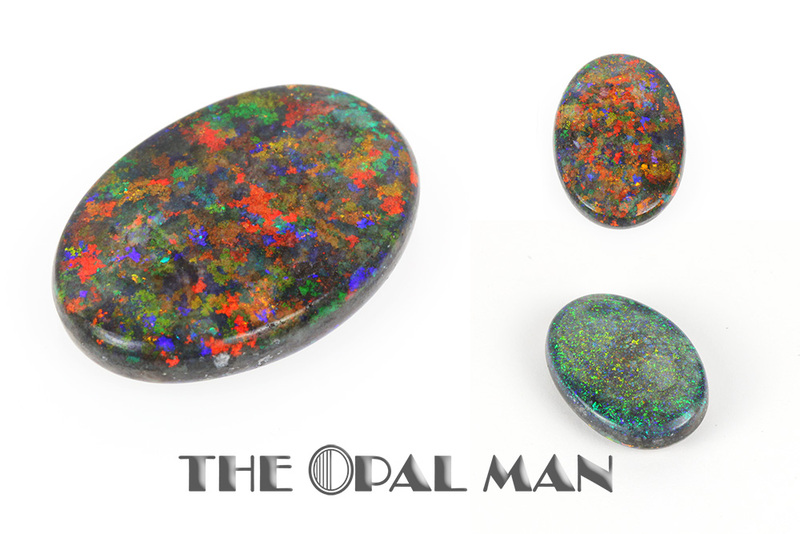 The Opal Man makes doublet opals here in the shop. In the picture shown here, the two layers of the doublet are distinctly visible. Triplet opals, just like doublet opals, can have a wide range of striking, beautiful color play and flash. They are comprised of three layers; hence the "tri" in the title. The top layer of a triplet is a clear quartz cap. The middle layer is real, natural opal, and the bottom layer is darker stone, usually onyx or ironstone. The quartz cap helps to protect the opal because it is higher on the Mohs hardness scale, it also magnifies the opal a little, giving it even more depth. Pictured to the left are a few examples of triplets with beautiful color and flash. Some opal forms in or on a porous, white parent stone, called the matrix. This type of lighter matrix stone, often found in Andamooka, Australia, can be treated so that it looks darker. Treating the matrix in this way can make the colors of the opal material look more vibrant and saturated than it would look against a white matrix. It is important to note that treating the opal matrix does not alter Australian opal, just the parent matrix. 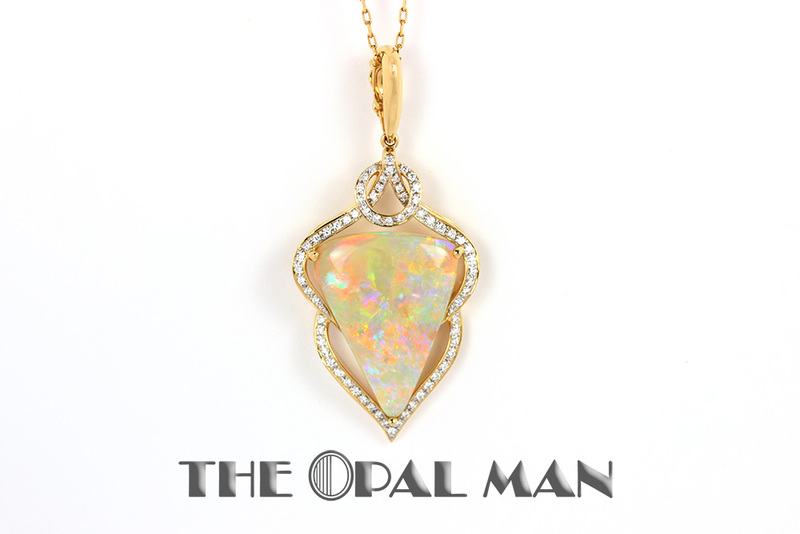 At The Opal Man, opals are always identified, so customers know what types of opal they are seeing. The opal pictured here is 18.47ct and measures at roughly 22.5mm x 14.0mm x 2.5 mm. There are two completely different colors and patterns on both sides of this brilliant stone! When small pieces of natural opal are put together to fill larger spaces or to make designs, we call it mosaic opal or opal mosaic. Mosaic opal can be made from opal pieces of various shapes and sizes. In the picture shown here, the turtle's shell is made of small chips of natural, Australian opal. This turtle design was designed and created at The Opal Man using sterling silver for its body. Often referred to as fire opal, Mexican opal has a red or red-orange base color with flashes of green and even blue. This type of opal is found in the mountains of central Mexico and has been mined since the late 1800s. Ethiopian opal comes in a variety of colors, from dark orange to clear white and everything in between, and often has flashes of green. We here at The Opal Man like to refer the more translucent version of this opal as the Jelly Opal because it has a jelly-like look to it. Most Ethiopian opal is mined in Welo, Ethiopia and these deposits produce hydrophane opals. "Hydrophane" means that the opal is porous and allows water to be absorbed into the stone. 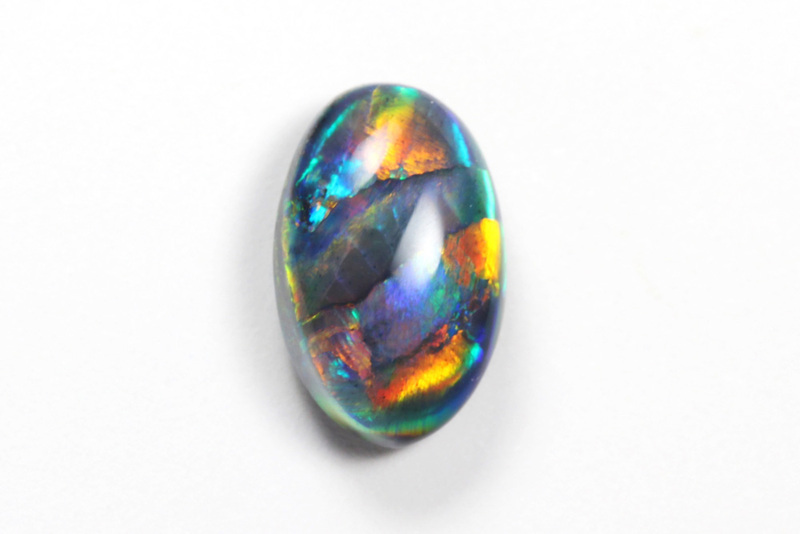 This absorption, which only occurs after being immersed in water for an extended period of time, often several hours, will likely change the color of the opal. However, some durability issues may arise from this hydrophane property in the opals, and the absorption of water can result in cracking. If your opal is immersed in water for a long period of time it is possible to de-water it by just allowing it to dry; this can take several days to a few weeks.